South Carolina has an expansive, competitive higher education system that presents prospective students with a wealth of educational options. From the religiously affiliated liberal arts institution to the nationally ranked public university, students can find a program that fits their personal and academic needs. Learn more about South Carolina colleges, use our search tool to compare colleges and universities, discover some of the most popular learning destinations in the state and find out what it really costs to complete a college education in South Carolina. South Carolina has a sizable and diverse system of higher education. The state is home to small and large, public and private, religious and secular postsecondary institutions with regionally and nationally ranked programs of study. We have sorted through this list of schools and ranked each based on shared criteria, including graduation rates, tuition and student-to-teacher ratios, to create the list of the best colleges in South Carolina. It can be challenging for prospective students to gather information to compare universities and colleges when they start their college planning process. The search tool below offers a one-stop solution, allowing students to sort and review South Carolina colleges by important factors, such as location, student enrollment, annual tuition and acceptance rates. Earning a college degree, whether an associate, bachelor's, certificate or doctorate, is a significant endeavor. Preparing for college takes planning-from selecting a program of study to accessing financial aid. Many programs in the South Carolina exist that focus on providing students with the support, information and counseling they need to make practical decisions about college, getting financial aid and preparing for the academic rigors of college. A statewide educational campaign, South Carolina Can Go focuses on increasing student access to a postsecondary education in South Carolina. A collaborative effort, the program brings together parents, guardians, counselors and educators to help students enroll in and succeed in college. Beyond informational and college planning resources, South Carolina Can Go also offers a range of scholarships and grants, including the Life Scholarship, Palmetto Fellowships and the SC Hope Scholarship. Sponsored by the South Carolina Commission on Higher Education, South Carolina Gear Up is a program to help low-income students prepare for postsecondary education. Gear Up collaborates with 15 school districts across the state, including 22 high schools. More than 4,000 students participate in the program, receiving educational support services to develop the skills necessary to transition from high school to college. The program is open to schools with at least half of the student body receiving free or reduced lunch prices and with 75 percent or more students living at the poverty level. Administered by the South Carolina Higher Education Tuition Grants Commission, this program provides need-based funding to undergraduate students who are attending an eligible institution on a full-time basis. Currently, 21 institutions in the state participate to offer grant funding to students. Grants are awarded based on a student's financial need and eligibility, considering factors such as family income and assets, cost of their university or college and overall financial situation. The maximum funding amount is $3,200 and, on average, students receive $2,710 from the program. Grant awards are renewable for up to four years, or eight total semesters, as long as the student makes progress toward their graduation. Earning a college degree can be a significant financial investment. Prospective students should do their homework and complete thorough research into the total cost of attendance, meaning they should figure the cost of college after tuition and financial aid packages are applied. To help, we have created the charts below that highlight tuition and financial aid rates at South Carolina colleges, including a comparison of how the state ranks against the national average. Average Financial Aid Award for South Carolina Students? For many students, the deciding factors for where to go to college include location and tuition. However, it can be challenging to get an accurate picture of tuition rates and fees at the different colleges throughout the state. 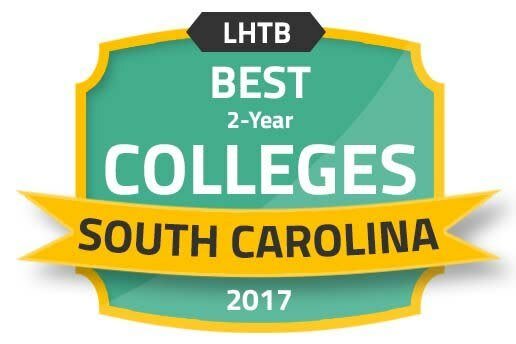 After reviewing tuition rates and financial aid packages, we have produced a series of tables and rankings of the most affordable colleges in South Carolina. A college degree prepares graduates for professional opportunities in their academic area of study, but not all college degrees are created equally. Based on data from the US Department of Education's College Scorecard, colleges in South Carolina offer a solid return on investment. Learn more about how alumni earnings of South Carolina colleges measure against national averages. Research from the Institute for College Access and Success revealed South Carolina graduates of public and private four-year institutions leave college with an average debt of $29,163. Student debt should be a substantial consideration for any prospective student. We have examined debt levels throughout the state and developed a ranking of the colleges in South Carolina that graduate students with the least amounts of student debt. When thinking about where to attend college, it is important for students to look beyond tuition, as it is only one of several factors that affect the total cost of completing a postsecondary education. Students need also to consider living costs like rent, groceries and utilities. According to the Missouri Economic Research and Information Center, South Carolina's cost of living is slightly above the national average. Students can use the tables below to learn more about what it costs to live and attend school in different metropolitan areas in South Carolina compared to the national rates. When students begin the college planning process, accreditation is a factor that might not make their list of items to review. Accreditation is important to consider, however, as it represents an institution's commitment to national academic and teaching standards. Attending an accredited institution allows students to transfer credits easily and qualify for future graduate study. The Southern Association of Colleges and Schools Commission on Colleges is the regional accrediting body responsible for reviewing and accrediting colleges in South Carolina. In addition to institution-level accreditation, individual academic programs are also subject to voluntary review. Below are two examples of programmatic-level accrediting bodies. Engineering Accreditation Commission accredits undergraduate engineering programs at the University of South Carolina. AACSB International accredits undergraduate and graduate programs of study for the School of Business at the College of Charleston. Charleston is the second largest city in South Carolina. Of its population of 132,609, nearly half have a bachelor's degree or higher, according to the U.S. Census Bureau. An educational hub, the city is home to five public and seven private universities, including the Medical University of South Carolina and Charleston School of Law. The Charleston Metro Chamber of Commerce projects more than 25,000 new jobs in the area in the next five years, including major growth in aviation and technology. The state's public and sea-grant institution, the College of Charleston, is located in downtown Charleston. A liberal arts and science university, the college was founded in 1770. Today, more than 10,000 undergraduate and 1,000 graduate students from 62 different countries are enrolled at the college. More than 500 faculty members teach across 66 academic programs, including 22 master's programs, eight certificate programs and 75 minors. An independent university, Charleston Southern University was founded in 1964. It is a Christian liberal arts institution affiliated with the South Carolina Baptist Convention. Students can select from 48 bachelor's degree programs in business, criminal justice, education, nursing and organizational management. The university also offers nine graduate degree programs across its eight academic colleges. With 162 full-time faculty, the university has a 15-to-1 student-to-faculty ratio, which provides for a small college learning atmosphere. A two-year technical school, Trident Technical College (TTC) is part of the South Carolina Technical College System. It is a public institution with an enrollment of 16,000 students completing associate and applied technical associate degrees, certificates and diplomas. The college offers more than 150 programs of study in the arts and sciences, agriculture, business, computer technology, health sciences, industrial technology and public service. Students may also complete programs entirely online through the college's TTC Online College, as well as career-focused continuing education and specialized employment training programs. The capital and largest city in South Carolina, Columbia has nearly 134,000 residents, according to the U.S. Census Bureau. It is the state's higher education epicenter with six major universities and colleges. In fact, more than 40 percent of the population holds a bachelor's degree or higher. Economically, the region is experiencing growth in numerous industries, including transportation and logistics, green energy production, advanced manufacturing, information technology and healthcare. A public four-year institution, the University of South Carolina has a main campus in Columbia and an additional six campuses throughout the state. Founded in 1801, the university has grown to a total enrollment of more than 33,000 students, including approximately 25,000 undergraduate and 8,500 graduate students. Recognized with a community engagement designation from the Carnegie Foundation, the University of South Carolina has donor support-a $545 million endowment-and a growing campus of 444 acres. A two-year technical college, Midlands Technical College offers more than 120 diploma, certificate and degree programs. Students may attend class at one of six campuses and select from day, evening and distance learning programs. More than 16,000 students are enrolled at the college. Academically, the college offers degree programs in the arts and sciences, business, education and human services, engineering technology, healthcare, industrial technology, information technology, and criminal and paralegal studies. Aligned with the Methodist Church, Columbia College is a women's college with a liberal arts education focus. Founded in 1854, the college has remained small, with 1,200 students and an 11-to-1 student-to-faculty ratio. More than 160 part- and full-time faculty teach 100 percent of the courses, as the school does not use teaching assistants in any class. Students may choose from 30 majors with an additional 12 majors available through a special evening program. At the graduate level, there are three majors: Master of Education in Higher Education, Master of Education in Divergent Learning and Master of Arts in Organizational Change and Leadership. Below is a list of resources for prospective students seeking additional information on college planning, scholarships and financial aid. Founded in 1967, the commission coordinates the state's 33 institutions of higher education, managing academic quality and administration of student financial aid and ensuring all students have access to a college education. A resource from the South Carolina Commission on Higher Education, this searchable database offers institutional and academic level data about public institutions, technical colleges and independent universities in South Carolina. This nonprofit organization founded in 2000 partners with higher education programs in the state, including the South Carolina Commission on Higher Education, to offer student learning initiatives that support student success. This nonprofit, membership-organization of the state's 20 independent colleges and universities supports student education through advocacy and scholarship programs including the SCICU Scholars Program. As South Carolina's only state-approved, nonprofit student-loan lender, South Carolina Loan Corporation provides a range of financial assistance programs to college students in the state. A resource for transfer students, SC Trac helps facilitate student movement between South Carolina's varied higher educational systems.